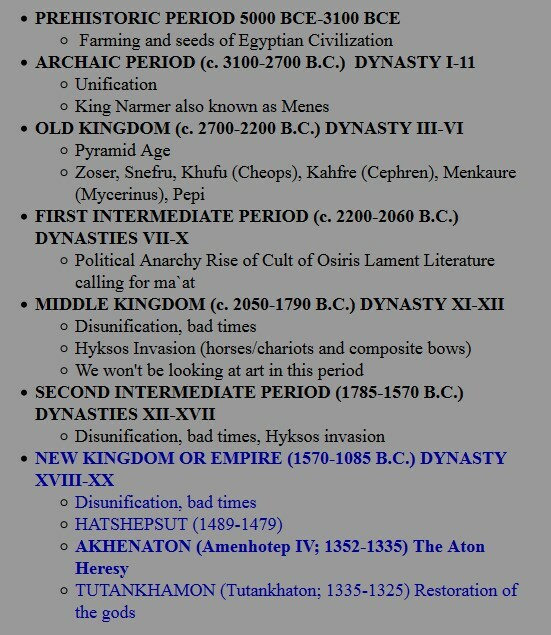 If you look at the timeline above you’ll see that there are a lot of dynasties and time periods that we haven’t looked at. The history the of these time periods is really interesting however the art doesn’t change very much during this time. A parallel to this are some of the dynasties in Chinese art history. The main idea is that we’ve established the archaic period and the old kingdom periods are the most significant for art history and they establish the schemas for the designs and the ideas that we are studying in this class. To review some of the main ideas that we looked at in terms of formal elements are, muscular bodies for aristocracy, composite view of the body, the artwork in general is lifelike however it becomes more idealized when portraying the aristocracy. Other smaller elements are that they share a blocky pose with one step forward, and there is iconography having to do with kingship such as beards, crowns, and the kilt. The next era we are going to discover was during the reign of the King Akhenaton. Akhenaton’s kingdom represents an important contextual and historical event in the Egyptian timeline. His accomplishments are really not accomplishments in favor of economics for the country nor did they help the economy of Egypt in any significant way. In fact Akhenaton was a terrible politician and really did nothing to help his people. What he did do was rewrite or redesign a large part or large elements of the previously existing religion. He basically rewrote who the most important God was, in this case he made of the sun God Aton, the most important God in the pantheon of gods. He didn’t completely eradicate the previous religion and the gods he sort of promoted some of them over the others. 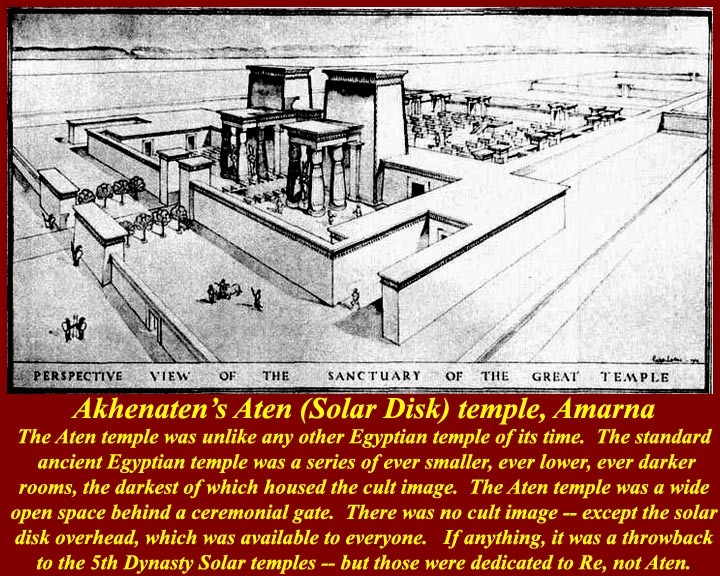 The big picture concerning Akhenaton’s reign that most historians seem to agree on is that he installed himself in a city called Armana down the Nile and began to worship the sun exclusively. His new religion was literally based in the warmth of the sun and had a sort of hedonistic live life now theme to it. You’ll see that the art kind of expresses this. It seems also that he disbanded many of the temples and unfunded some of the temples that had to do with mummification and prescribed worship of the afterlife. This could make an interesting topic for paper. Was that a bigger time for tomb robbing than any other time? The changes in the art that come out of Akhenaton’s reign are really significant and last only during his reign and it seems to revert back to the previous style by the time of his grandson King Tut which was less than 75 years later. In this full-scale representation of Akhenaton can see the elements that make his style of Egyptian art so different from any other periods. To start with, the body isn’t idealized in the same way that other Kings have their bodys idealized. For example the anatomy of the earlier King shows that he is thin wasted with broad shoulders muscular arms and asymmetrical well proportioned featured face. 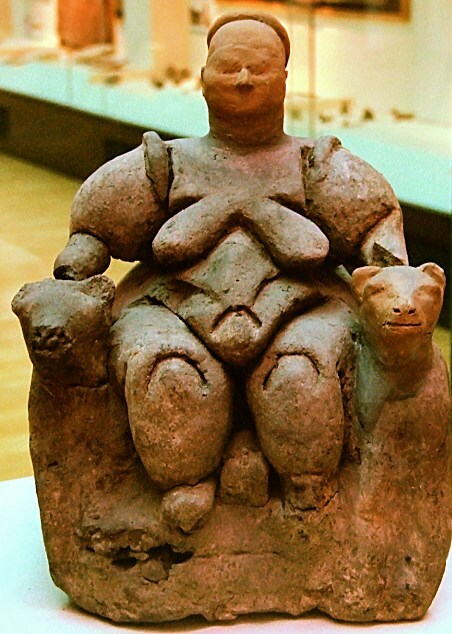 The representation of Akhenaton shows that his stomach is slightly distended, it rolls out over his kilt, his hips are wider than most men’s, and his face is almost a caricature that seems to exaggerate the length of the neck, the chin, and the nose. These two sculptures then are really very different and emphasize different elements and features. Comparing these in terms of iconography will help you understand that each King has chosen to hire artist that will represent him in the way that he wants to be portrayed. Starting with some of the things that these portrait share, they both have headdresses, in one case it is the khat headdress, the others looks a little bit like one of the earlier crowns we looked at the crown of upper Egypt. They both have beards and even the pose has a similar blocky or squared off quality. However, even though you can tell that they probably use the method of drawing on the front and the sides of a block of stone to start the sculpture of Akhenaton, the sculpture of Akhenaton has some curves to it. The sculpture of Akhenaton scribes overall anatomy as being curvy, which I assume in our culture and their culture was a feminine attribute, (are they portraying Akhenaton as being feminine?). 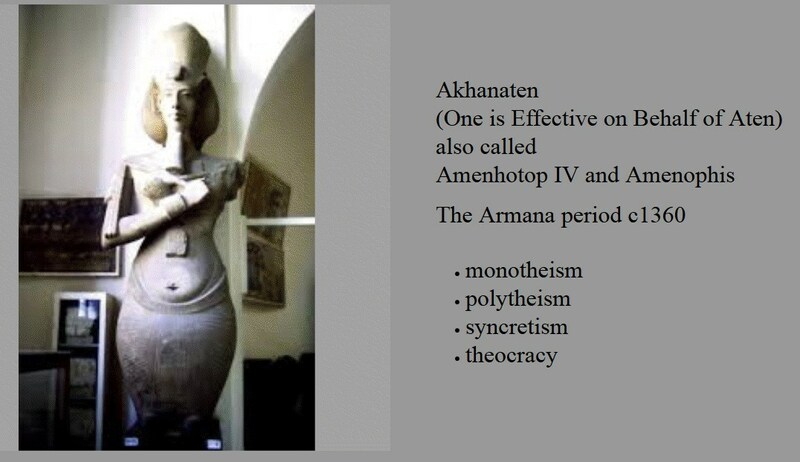 Various sources have theories to justify or explain the look of Akhenaton’s style of sculpture. One theory is that it is more naturalistic and/or lifelike and since the religion changed and it was more based on living rather than the afterlife the work is more lifelike. This theory only applies if you think that Akhenaton’s looks more realistic. To me, it looks like a caricature. Another theory to account for the caricature like nature of most of the art made during Akhenaton’s era, is that they are attempting to show the character and or characteristics that are part of the family resemblance that Akhenaton and his family share. There are people who kind of look somewhat like this in today’s world. And there is even a genetic anomaly called Marfan’s Syndrome, which causes mutations or exaggerations in the length of the torso and elongates the features of the face. National Geographic magazine the boy King’s skeleton to create a computer model and then some forensic scientists reconstructed a model of King Tut. 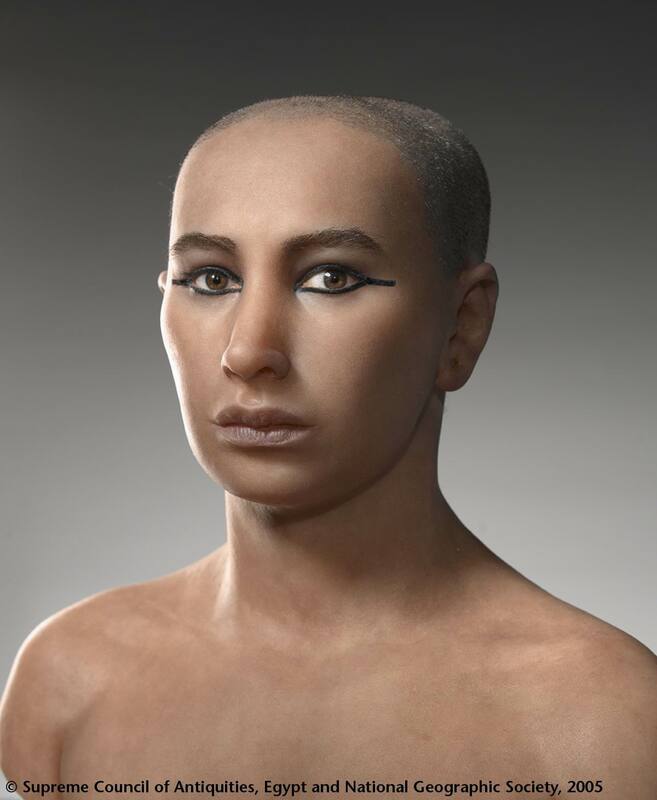 According to scientists this is what King Tut looked like. More research was done with genetics and Akhenaton and King Tut both have physical remains in the form of mummies so they ran genetic tests. 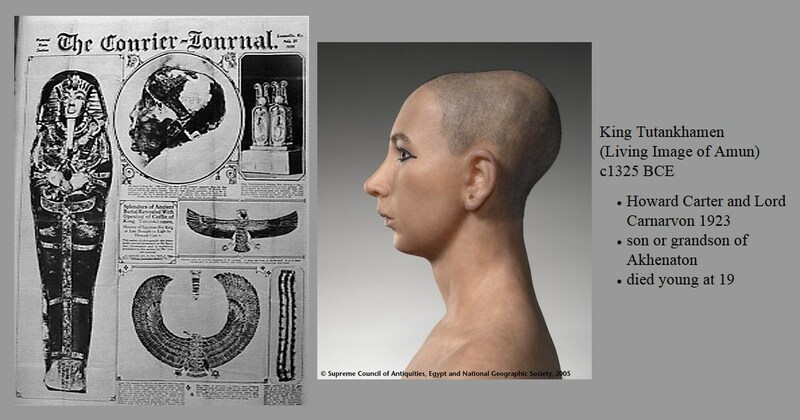 National Geographic magazine ran some articles on this and basically pronounced that Akhenaton did NOT have a genetic disorder and furthermore Akhenaton was related to King Tut (Granpappy). In addition to proving that King Tut had not been murdered the National Geographic article used computer modeling to describe some of the characteristics of the King’s family. 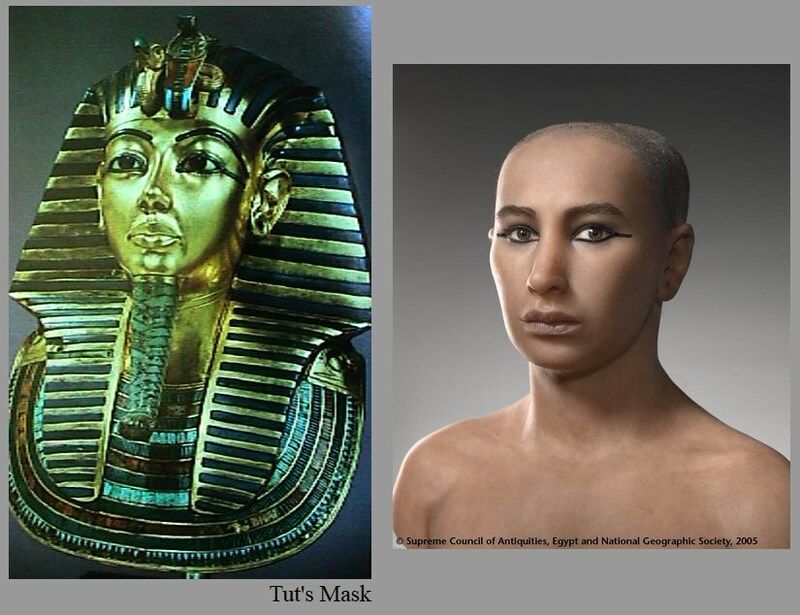 They even created a 3-D model of what Tut looked like. The conclusion is that sculptures made by the Egyptians of Akhenaton and King Tut do look quite a bit like them. I suppose it’s up to you to decide whether or not you think it’s a caricature or more realistic depiction. Perhaps Akhenaton was influenced by an artist at his court who had a particular style that Akhenaton really liked? 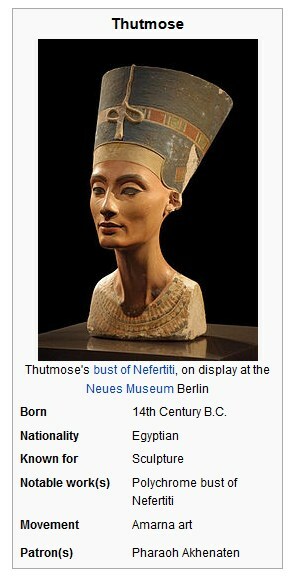 One possible theory is that the artist named Thutmos who made this sculpture of Nefertiti might have been the source of this new style for training the King’s family. German archaeologists early in the 19th century discovered a sculpture studio in Egypt and were able to identify it as the artists house known as Thutmose. This portrait of Queen Nefertiti was found at Thutmose’s home and studio in the site of the ancient city called Armana. The site founded there is not very well preserved. At times it is below the waterline. Often the Nile River flows over its banks and covers the site. The buildings that were constructed there don’t exist anymore because they were made from less permanent materials then some of the palaces and temples were. Partly this is because King Akhenaton the head of his Empire to this city that he had built just for him. This is also the reason why you will see some relief sculptures and statuettes of King Akhenaton’s co ruler named Smenkhare. This statuette along with several others is thought to represent Queen Nefertiti based on these two contextual facts. Archaeologists found a rubbish pit inside the house that contained this sculpture (an others) and in the trash left over there they found a bit of ivory that it been used as a horse blinder and it had been inscribed with the name of Thutmose the sculptor. Since they found the sculpture, which by the way is unfinished, they put these facts together and now most people believe that it’s a model for other works of art by the artist Thutmose. The bust is made of limestone which is covered with modelled gypsum. The eye is inlayed with crystal and the pupil attached with black colored wax. The second eye was never finished. The anatomy of the face and head is fairly naturalistic. The only feature that seems to be exaggerated or caricatured in this instance is the overall longneck. 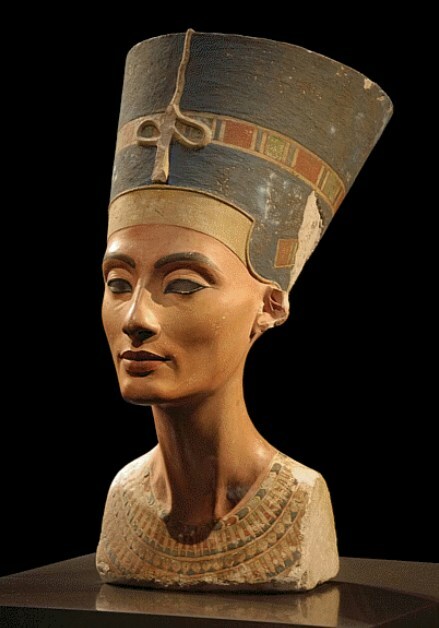 If you look at the face of Nefertiti some people have interpreted that it is very naturalistic and that cheeks are sunken and her chin is slightly weakened. (I found this comment on the museum for Egyptian art in Berlin website.) However, to me she looks rather idealized almost in the same way that we airbrushed out some wrinkles and fat folds in our own magazines with beautiful women in them today. Nefertiti is wearing some sort of flattopped crown that has on the front of it a snake symbol which represents a rearing cobra. This snake symbol is often referred to as the “uraeus.” If you research the various helmets and headdresses that the Egyptian rulers wore you’ll see that there are many references to cobras and snakes. In some instances this is a reference back to one of the primeval gods. Here’s a sunken relief carving of King Akhenaton and his family juxtaposed against King Narmer’s palette. The depiction of Akhenaton and his family is made in a different style of relief sculpture then King Narmer’s palette. The figures in Akhenaton’s sculpture are sunken into the background. This style of sort of carving into the base is called sunken relief. The anatomy of Akhenaton and his family is significantly different from King Narmer’s anatomy. Akhenaton’s figures don’t adhere to the schema of Narmer’s palette. King Narmer’s figure is squared off and the shoulders and arms depict hard-edged right angles as well as muscular arms. Where is Akhenaton mistaken for a female in terms of the Egyptian conventions of how women were portrayed earlier. 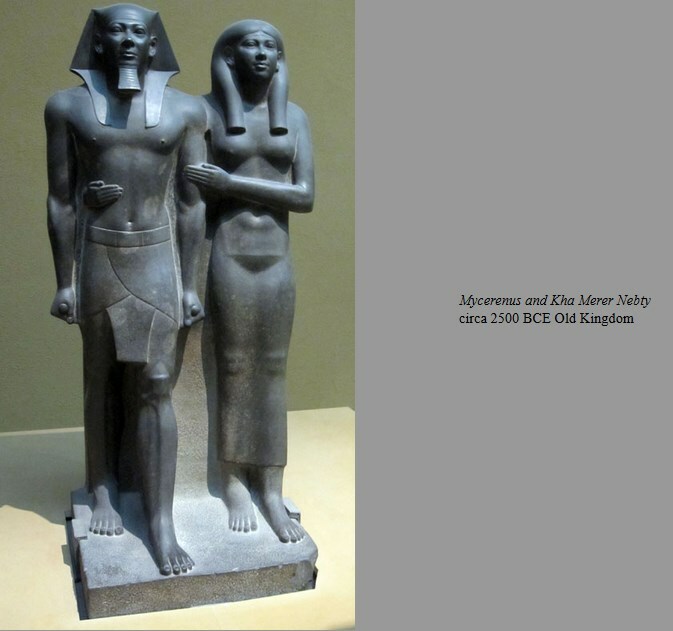 Akhenaton and his wife both have swelling hips and curves and thin almost stick like arms. The anatomy of the heads and the children they are holding looks almost like the disease we discussed earlier however according to context these heads are not depicting distorted skulls. So the heads are stylized in a different way in Akhenaton’s sculpture than they are in Narmer’s. The subject matter is very different between these two plaques. Akhenaton and his wife are depicted seated on to low chairs holding their children and Akhenaton is actually kissing one of his children, whereas Narmer’s scene clearly shows him as a warrior. We’ve seen a juxtaposition of war and peace in the Standard of UR. In this instance we see war and peace across the centuries. 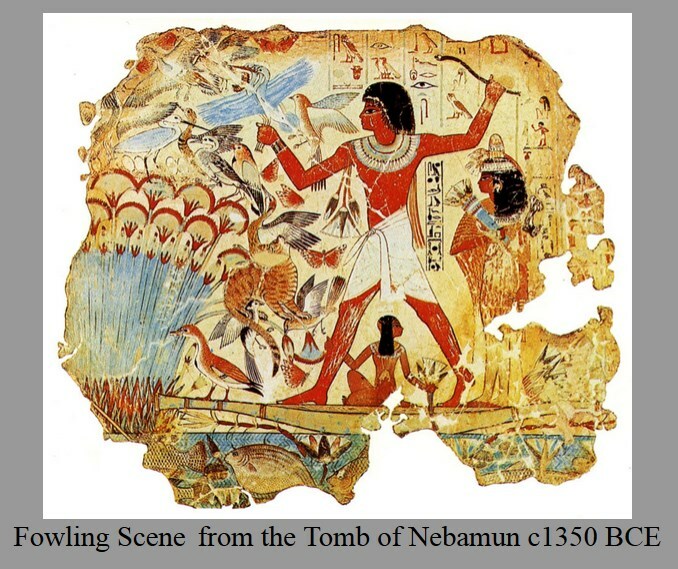 Akhenaton’s scene is a type of scene referred to as a genre scene. A genre scene according to art historians is a scene of everyday life and often will show people in a more relaxed humanistic manner. That leaves us with the idea of why would Akhenaton change the subject matter of his art? This is one of those iconographic questions that historians have been arguing over to explain the changes in the style of art during Akhenaton’s reign as king. The starburst which is actually a depiction of the sun and its rays that’s between Akhenaton and his wife is actually depiction of the sun God Aton and according to some contextual analysis about the history of Akhenaton it makes some sort of sense. The plaque depicting King Akhenaton and his family can be explained by the fact that he switched his religion to worshiping the sun. Court life at the city he created Armarna, has been described as being held mainly outside in the glaring sun. Further documentation occurs from a Mesopotamian source in which some diplomats came down to visit Akhenaton in an effort to broker a diplomatic marriage. The Mesopotamians commented on how uncomfortable the meeting was because it was held in the full glare of the noontime sun in a courtyard. 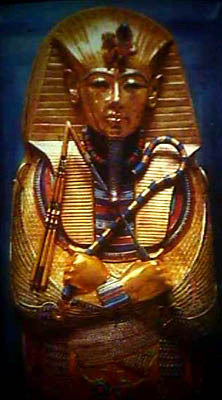 Akhenaton had a grandson in this grandson, King Tut, did nothing significant in particular during his reign. In fact documents that historians of found may indicate that he was just a figurehead and that other than him running the government. The thing that makes his tomb so significant is basically the fact that it was left largely intact. His burial seems to of been a hasty process in a borrowed tomb that was so insignificant in some ways and located slightly below the sand line that it wasn’t discovered until the 1920s. The characters who discovered it are almost like characters out of an Agatha Christie novel. In fact, when we studied Mesopotamia Agatha Christie was one of the visitors to Lord Wooley’s excavation. It starts with the car accident. Lord Carnarvan from England was one of the first people to ever own a car and of course he was speeding and he also is the first person on record to have a car accident. His doctors suggested that he moved to a warm dry climate for his injuries and to recover. A young son of an artist Howard Carter who was not wealthy but connected somewhat with society was suggested as his companion. It turns out that Carter had an incredible talent for archaeology but was also very lucky as well. At the end of his career he had already excavated the major find of the century and was the director of the Egyptian Museum. The tomb had been robbed once before but not much had been taken and was abandoned for some reason in the middle of the robbery. The tomb is important because it gives us a record of the most important artifacts associated with the Egyptian cult of the dead. Other items and objects from other tombs were often found out of context or collected but this was a large complete collection which gave us the context we needed to really understand the burial of Kings and possibly a little bit more about some of the Egyptian culture from around 1350 BCE. Perhaps the most important item in the tomb was the sarcophagus and mummy that was found intact. Egyptians believed that in order to travel to the afterlife the physical remains of the deceased needed to be preserved. The process is basically similar to the process in which someone would make beef jerky. Basically salts and oils are used to dry and impregnate the skin so that it becomes almost like tanned leather. The process is laid out here. The mask as well as the sarcophagus made of gold, there was also a stone sarcophagus surrounding all of it, all have fairly realistic looking features that resemble a handsome Egyptian male. The reconstruction on the right does look a little bit like it you decide whether or not it’s an accurate likeness. The anatomy seems correct however the eyes might be a tad overlarge as we saw in Mesopotamia. All are life-size and inlaid with turquoise and other precious stones on a gold surface. Clearly the precious materials used to construct these are part of the iconography because it’s a conspicuous consumption and use of prestige and wealth items and substances. The iconography goes beyond that in that we see many of the same icons from earlier works of art used in this. Kings carried scepters that were called the crook and flail. Various interpretations of the crook and flail provide the idea that they refer to the Kings role as a good shepherd of the people. You will also see this applied to Jesus in terms of iconography. The curved staff looks like a shepherds crook. The flail is a small whiplike device with the stick and several beaded strands coming off of it. Basically it’s a kind of whip however it could also be an extension of using some sort of fan or device the flies off. Most historians feel that it may be a reference to discipline and strength. So the crook and flail depict the dual role of the King as being a shepherd and also a source of discipline. Several references to cobras and snakes are part of the system of iconography that is associated with Kings in the sculpture. We see the same rearing snake’s head or “uraeus” coming out of the cobra like headdress called a khat. The King is also wearing a beard and his eyes are adorned with the makeup that was associated with the aristocracy. The exterior of the sarcophagus is also a representation of the linen wraps used for mummification. Other items found in the tomb and associated with burial rituals are these “canopic” jars. In this instance these jars which were used to preserve the internal organs after they had been removed from the body all look like King Tut. These bracelets are also iconographic of rebirth and regeneration since the beetle is a symbol of the sun moving across the universe and also seems to give birth to itself again. This might be associated the practice of the beetle rolling balls of mud or feces and planting larva in the ball. The round ball representing perhaps a planet the sun and the fact that the insects emerge from it seems to have symbolic residence for the Egyptians. You will see many references to scarab beatles throughout Egyptian art. This is a small wooden box that is lined with silver and the exterior has gold sheets that have been pressed and inlaid with precious stones. The tomb Carter found was not completely intact. Some items seem to been removed and moved about. One item that was discovered within a large chest was this box. When Howard Carter discovered this box in the tomb thieves had already removed what they think was probably a mirror inside of it. Carter believed that there was a mirror originally inside made of precious metal. Part of his supposition is that the shape of the box is equated with the word for mirror. 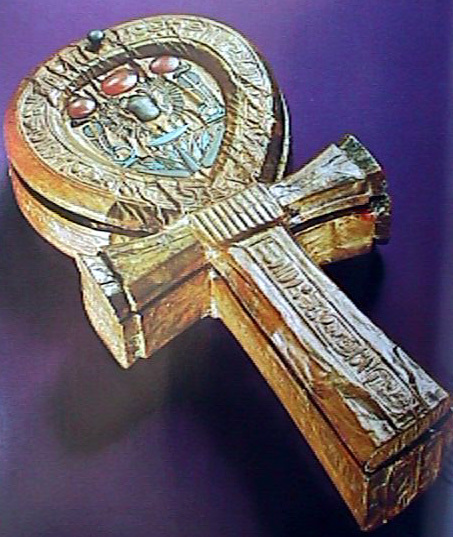 The symbol of the Ankh means life. So it makes sense that it would be placed in a tomb. Also, there is a sort of link between the words in Egyptian mirror with the word for life. It’s a type of pun. The name of the King and several symbols including snake symbols we’ve discussed before were found decorating the exterior of the box. This stool found within the tomb is a kind of picture within the picture for us because of the gold relief found on the side of a box nearby. The Tut is seated on a stool just like it in this beaten metal plaque that was on the side of a box. 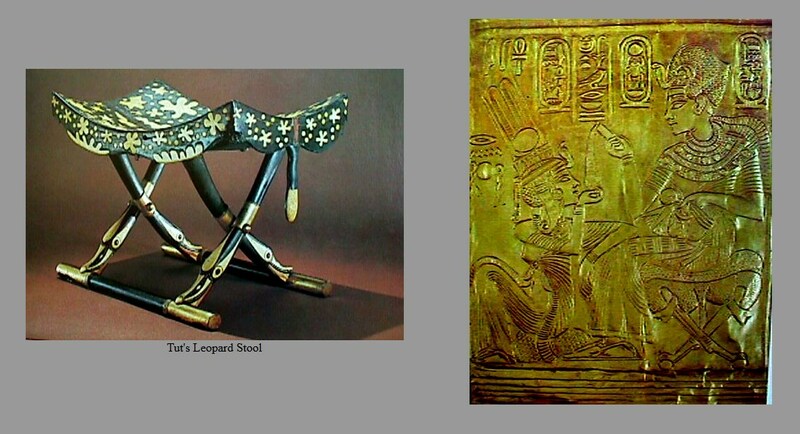 The juxtaposition of these two items allows us to see several things in terms of Egyptian iconography that also seem to transcend or be used in many other cultures. The leopard stool has paint and carving on it that is supposed to symbolize the spots of the leopard. It also has a little tail hanging off the back and the legs are carved a little bit to look like leopard’s paws. We see the same stool in the relief on the right. In many cultures including those of North Africa which is close by the symbol of a leopard is used to indicate kingship. We also see similar leopard symbols as far back as the culture at Cattle Huyuk. We will be focusing on the main picture on the side of this chest. 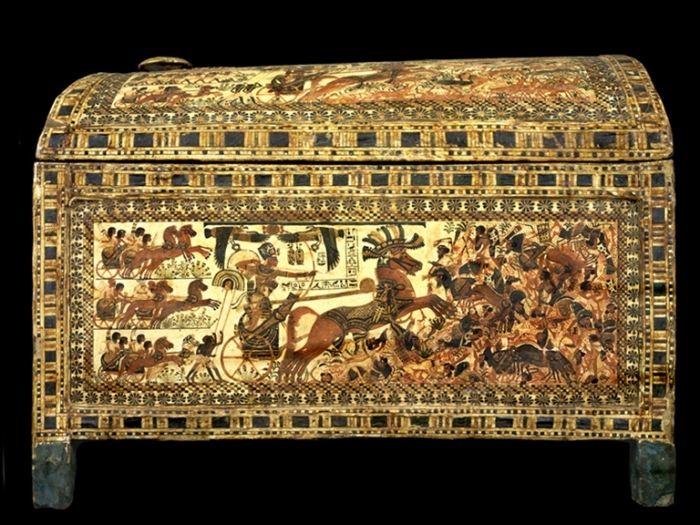 The same scene is depicted on several sides of this chest and framed by a series of geometric and floral designs around the borders. In the center of the scene are a series of hieroglyphs. 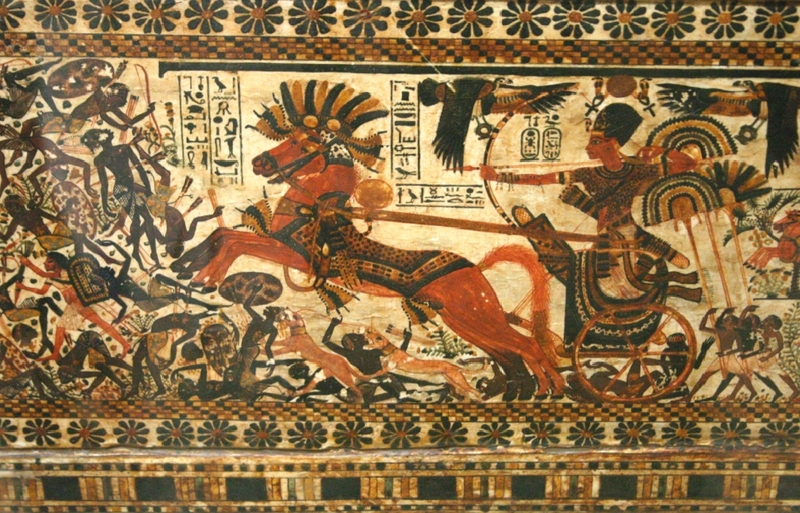 In the center of the composition is a representation of a large figure of a man wearing a helmet pulling back a bow and writing a chariot. To the right of this are a series of smaller dark skinned people who are in various poses that represent death and they are being run over by the chariot. In some ways, this is very similar to the iconography found on the standard found at Mesopotamia. Behind the representation of the charioteer on one side shows a series of servants caring some fans or standards and on the other side shows a series of other charioteers following the large charioteer in the center. This scene represents King tut in hieratic scale in battle, something which he would’ve never done. In my studies I’ve also come across several ideas concerning race and skin color in terms of the Egyptian culture. Also, there are several instances in which Egyptians of had to fight off darker skinned people from various regions and this is part of their history and their mythology. 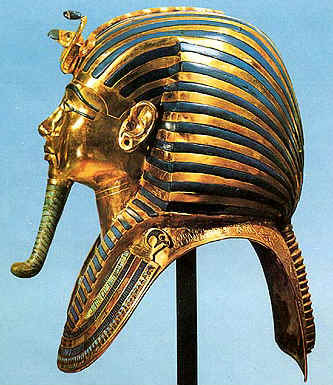 In essence, King tut is being represented as a leader of the military he is actually even wearing a military helmet. He is showing that he can shoot a bow and arrow as well as write a chariot into battle. Very early in Egyptian civilization there was a festival in which the King would have to prove that he was still fit to rule. He would wrestle with young men shoot arrows and show his physical prowess in a number of ways. It appears, that before 3000 BCE the time of King Narmer, this practice if the King couldn’t pass would result in the King being killed. Later on the ceremony degenerated into basically just an act in which he was still putting power. This decoration on this chest may be the end result of a long series of traditional images that are designed to show that the King was a good ruler and physically able to be a ruler and therefore he should be allowed into the court of Osiris which is a type of Egyptian heaven.